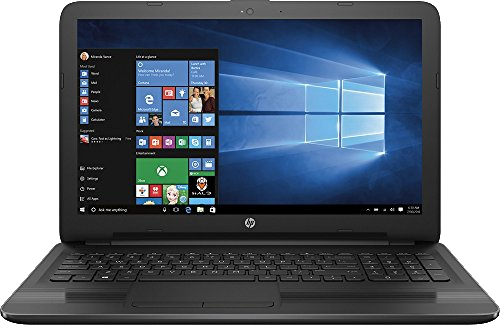 Thunderbolt 3 products have really come down in price with one of the budget friendly Thunderbolt 3 products available is the StarTech Thunderbolt 3 Docking Station (No Power Delivery). 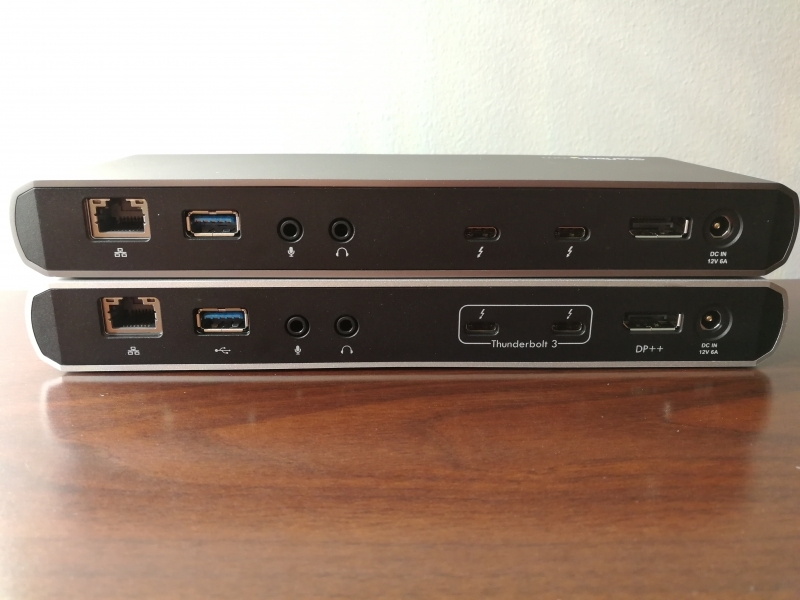 These Thunderbolt 3 docks expand connectivity options for your Thunderbolt 3 enabled Mac or Windows PC. 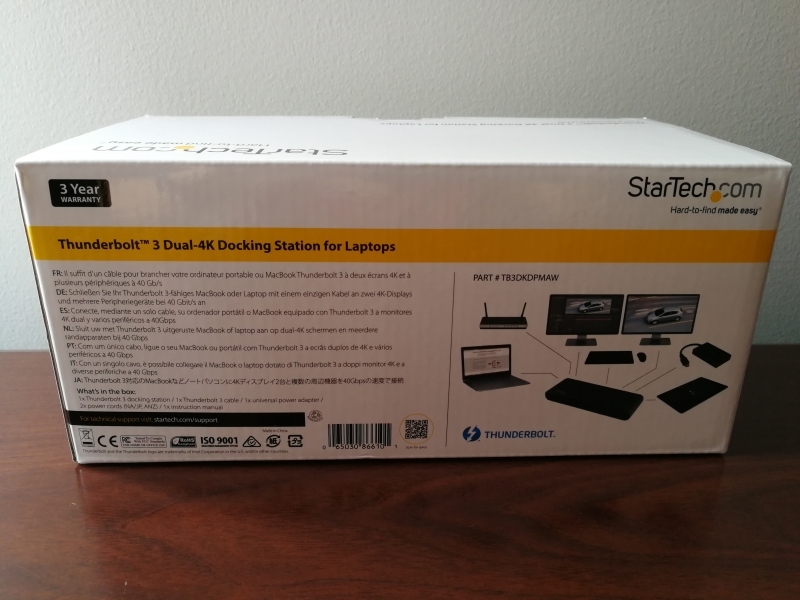 If you don't need your dock to provide power (meaning you can use a separate AC adapter with your Mac or PC), the StarTech Thunderbolt 3 Docking Station (No Power Delivery) is very affordable. 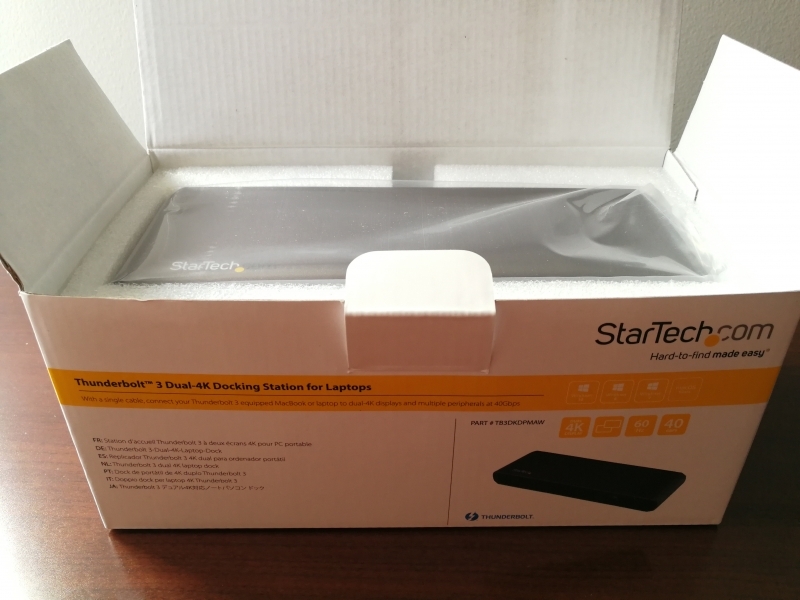 If you need the dock to provide power, then choose the StarTech Thunderbolt 3 Docking Station with Power Delivery which can provide 85W to the Mac or PC, although it will be more expensive. Note the StarTech Thunderbolt 3 Docking Station (No Power Delivery) does provide very slow 15W of trickle charging to the Mac or PC. 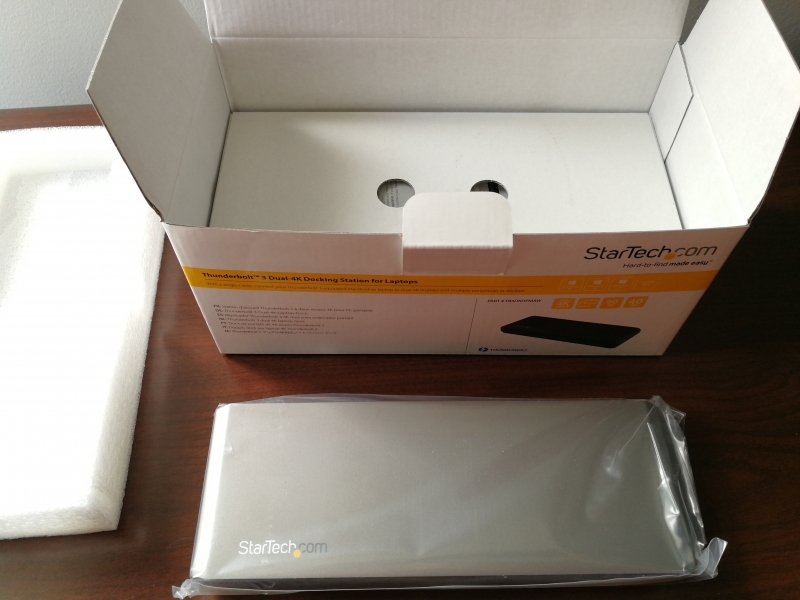 To take a closer look at the StarTech Thunderbolt 3 Docking Station (No Power Delivery), we purchased it through Amazon Prime. 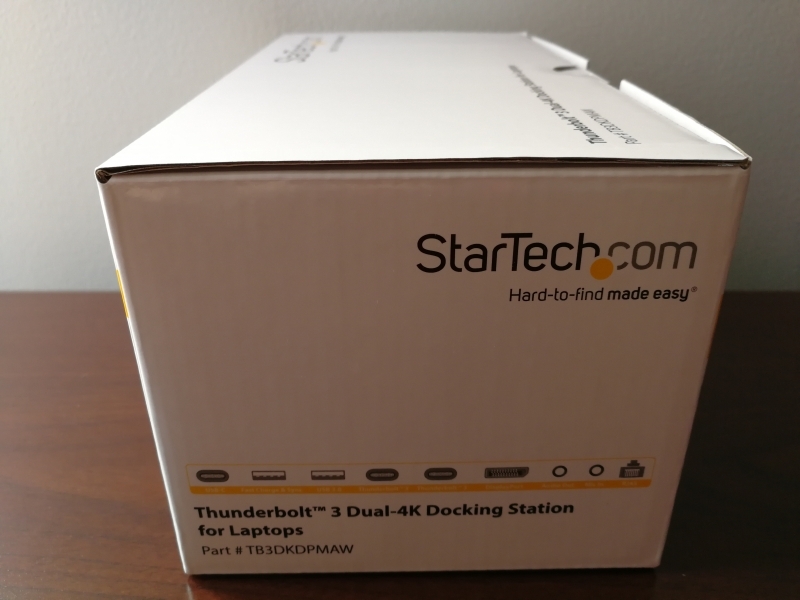 Opening up the box which comes with traditional StarTech yellow, the StarTech Thunderbolt 3 Docking Station (No Power Delivery) comes with a Thunderbolt 3 cable, AC power adapter, and documentation. 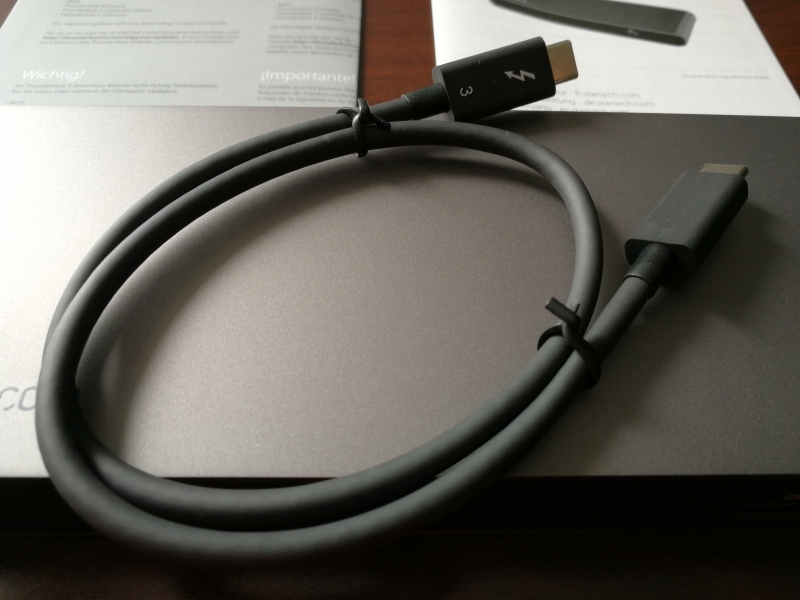 The Thunderbolt 3 cable is needed to connect the StarTech Thunderbolt 3 Docking Station (No Power Delivery) to the Thunderbolt 3 Windows PC or Mac. 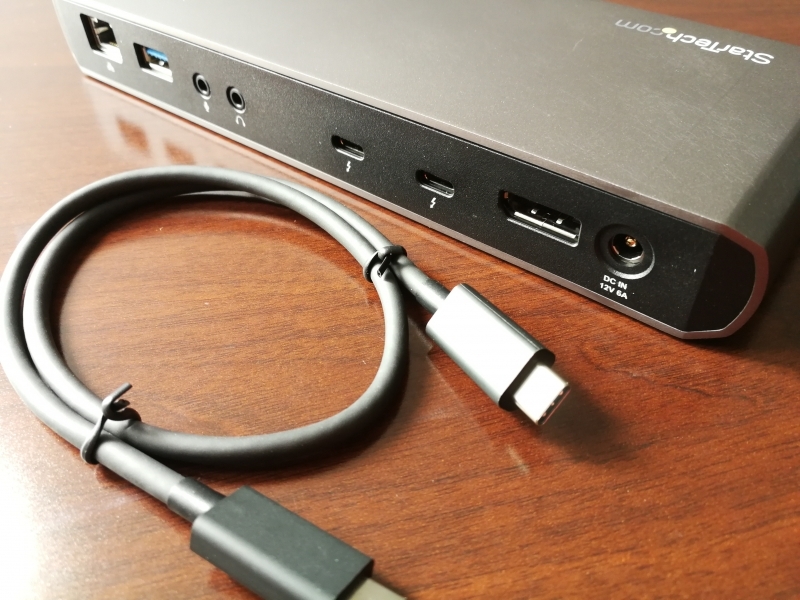 The Thunderbolt 3 cable connects to one of the Thunderbolt 3 ports at the back of the StarTech Thunderbolt 3 Docking Station (No Power Delivery). 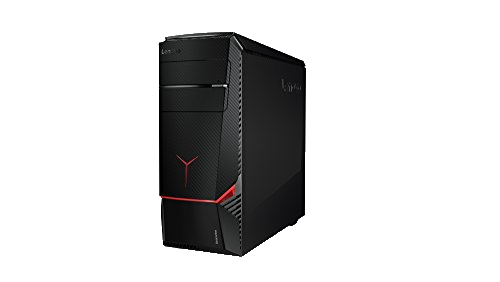 The Thunderbolt 3 port that is not connected to the computer can then connect to other Thunderbolt 3 (40 Gb/s) devices, USB 3.1 Gen 2 (10 Gb/s) devices, and DisplayPort 1.2 monitors. 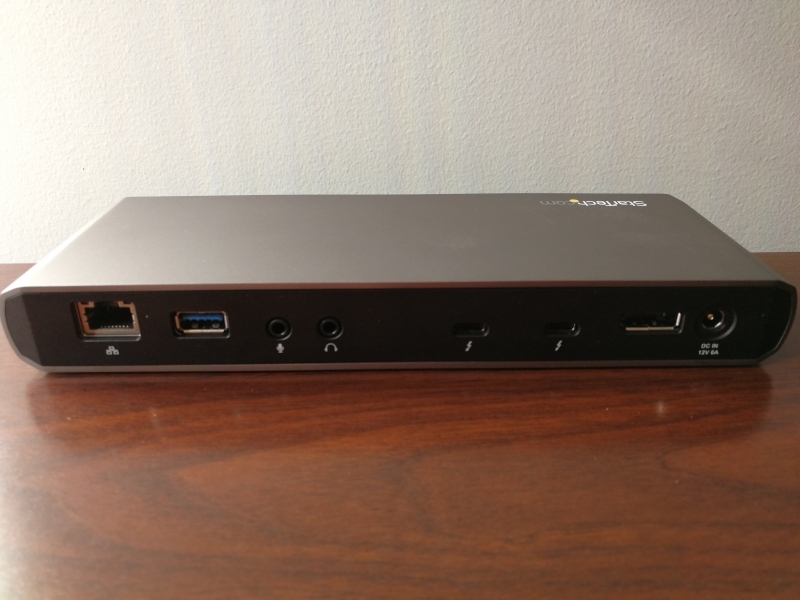 The back of the StarTech Thunderbolt 3 Docking Station (No Power Delivery) also has a standard DisplayPort 1.2 connector for video output, Gigabit Ethernet, a USB 3.1 Gen 1 (5 Gb/s) Type-A port, and 3.5mm audio in/out jacks. Note you can connect two 4K displays through the Thunderbolt 3 and standard DisplayPort connectors. 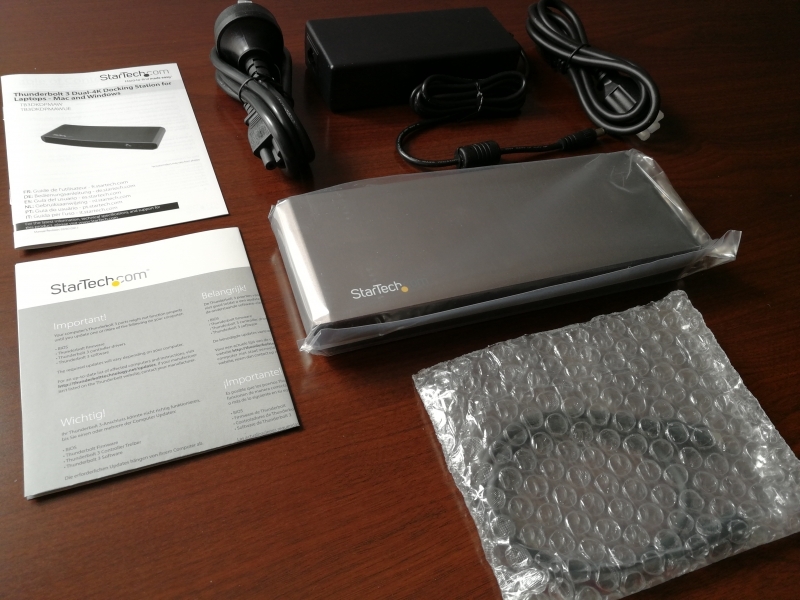 The StarTech Thunderbolt 3 Docking Station (No Power Delivery) doesn't depend on the computer for power so you need to connect the AC adapter to the back of the docking station in order to use it. 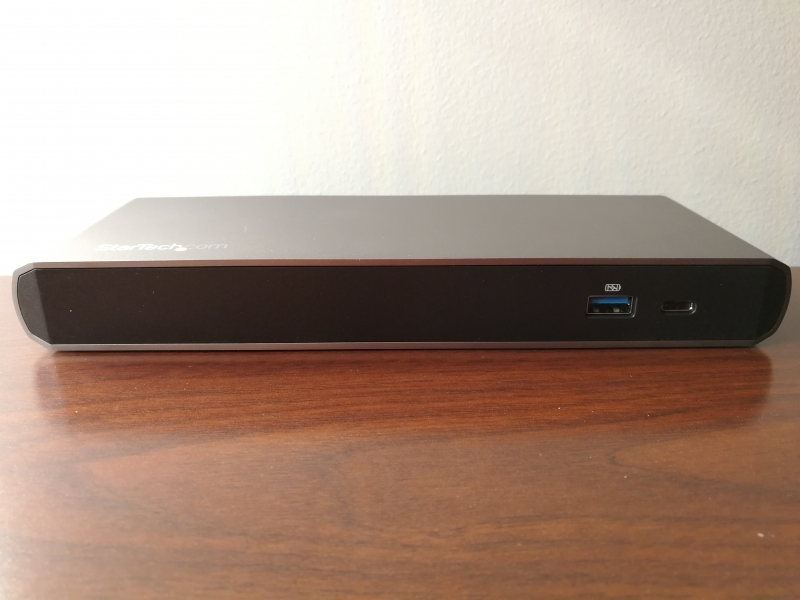 The front of the StarTech Thunderbolt 3 Docking Station (No Power Delivery) has a USB 3.1 Gen 1 (5 Gbs/) Type-A port as well as a USB 3.1 Gen 1 (5 Gb/s) Type-C port. 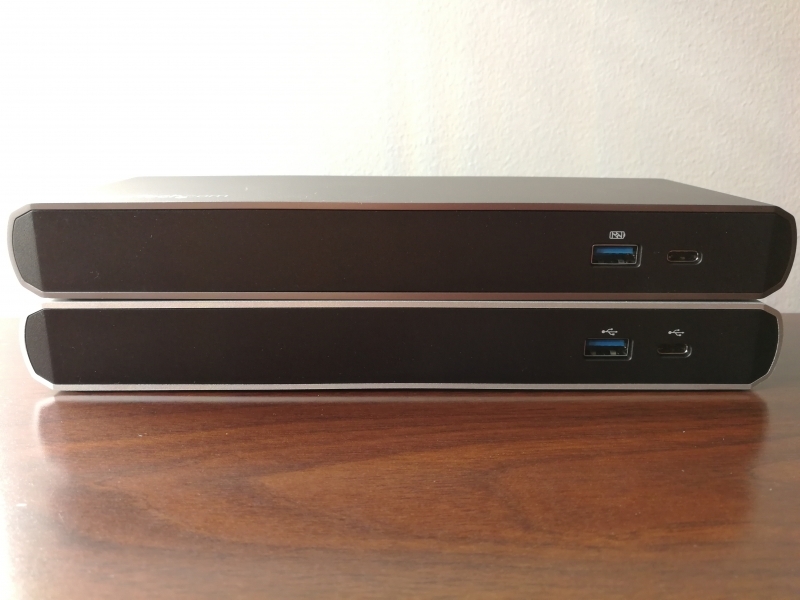 The StarTech Thunderbolt 3 Docking Station (No Power Delivery) has a very similar design to the Plugable Thunderbolt 3 Docking Station (No Host Charging) which is also similarly priced. 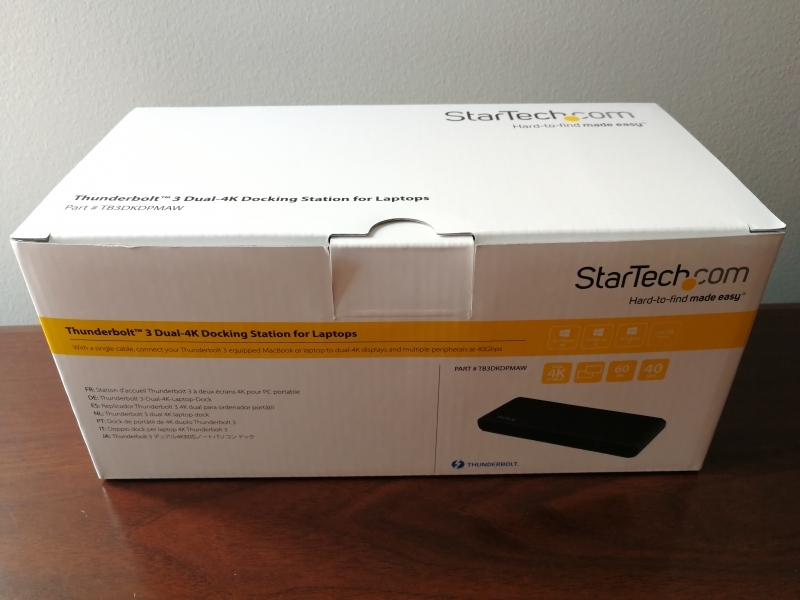 The StarTech Thunderbolt 3 Docking Station (No Power Delivery) and StarTech Thunderbolt 3 Docking Station with Power Delivery help to expand the connectivity options for your Thunderbolt 3 Mac or PC so you can connect to just about any peripheral.